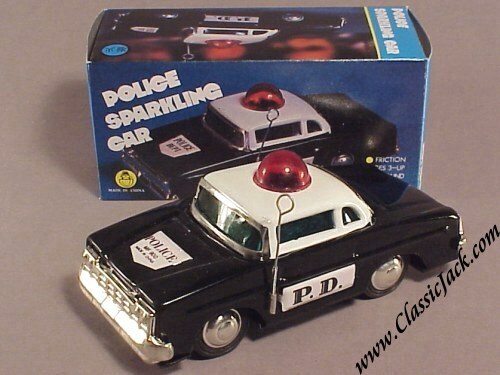 Tin-Plate, Friction Drive Sparkling Police Car. This is current production police patrol car with a great red light mechanism. When the friction drive is "loaded" and the car is released, it will drive forward while a mechanism inside the car will produce sparks inside the translucent red light, thus suggesting a working red light. It is friction powered on the rear wheels. It comes in its original colorful box (see picture). It measures some 5.6 inches in length. 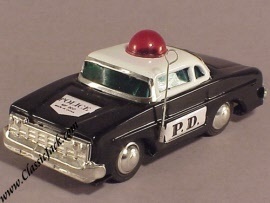 This car is for collectors only and not suitable for children!